On May 16, 2019, Greg McDougall, founder and CEO of the Harbour Air Group and Harbour Air Seaplanes, will be one of two B.C.-based industry leaders to be inducted into Canada’s Aviation Hall of Fame. The 2019 inductions will be the 46th annual celebration of Canadian aviation accomplishments and will bring to 237 the number of Canadians who have been installed as Members of the Hall. In addition, 23 organizations have been honored for their contributions, receiving the Belt of Orion Award of Excellence. Starting out with two planes servicing the forestry industry, Harbour Air has grown into one of the largest all-seaplane airlines in the world and now plays a vital part in B.C.’s transportation infrastructure. With more than 450 staff and transporting more than 500,000 passengers each year, Harbour Air is internationally renowned for its business model and offers consulting services to airlines around the world, including the UK, USA and China. In 2007, Harbour Air was the first airline in North America to become completely carbon neutral, an achievement it continues to this day. 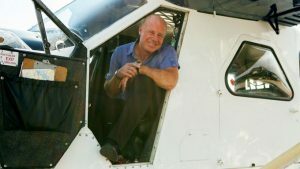 Born in 1955 in Santa Barbara, California, McDougall made annual family trips to his family’s remote cabin in B.C., which sparked his desire to return to the coast and begin flying commercially. In 1982, during an economic downturn, when the company he was working for began to struggle, McDougall decided to lease back the aircraft, co-founding Harbour Air. Over the next 35-plus years, Harbour Air grew, offering scenic tours, private flights and scheduled service across 12 destinations, including its first international service between downtown Seattle and downtown Vancouver, which launched in Spring 2018.